A Simple Guide to Home Water Filters - Water Filter Pitchers, Reverse Osmosis Filters, Refrigerator Water Filters, Faucet Water Filters, Shower Water Filters, etc. Home water filters are most often used to reduce chemical exposure from municipally treated water supplies. Most water filters for household use employ an activated carbon media which reduces many impurities including chlorine, lead, mercury, cysts, pesticides and other impurities. Here is a simple guide to some of the most common household water filters on the market today. Pitchers or carafes with built in water filters provide cold, filtered water. Simply refill the pitcher through the top, and the water flows down through a filter into the main canister at the bottom. There are many different styles of pitchers that can fit neatly into your fridge or on your tabletop. These typically use a carbon filter media that reduces bad taste and odor caused by chemicals like chlorine and its byproducts, along with lead, mercury, sediment and dirt. Some pitcher water filters may also remove microbiological cysts and agricultural and industrial pollutants. The filters should be changed every 2-3 months, and many pitchers come with an electronic filter life indicator that lets you know when it's time to change the filter. One disadvantage of pitcher filters is that they hold limited quantities of water and are therefore best used in smaller households. Faucet water filters attach directly to your sink's faucet. These allow you to switch back and forth between unfiltered and filtered water for cooking and drinking, extending the life of your filter. Many faucet filters also have an electronic filter life indicator to let you know when it's time to change the filter. Faucet filters will reduce many of the same contaminants as pitcher filters. The advantage to these is that they don't take up as much space as other filters do. But if you like your water ice cold without the cubes, you may be better off with a pitcher filter - at least during the summer months. Counter top filters also fit directly onto the faucet. They take up more counter space than faucet mount filters, as they sit directly on your counter top. However, they allow you to filter larger quantities of water without modifying any plumbing, and they are less likely to clog than pitcher or faucet filters. Countertop filters remove many of the same impurities as pitcher and faucet mount filters, providing you with fresh, clean drinking water straight from your tap. Undersink water filters require some minor plumbing modifications to install. These fit directly inside the cabinet under a kitchen sink and come with a separate dispenser that fits through a drilled hole in your sink or countertop. 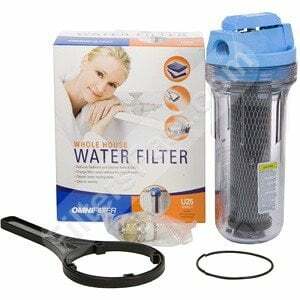 Like countertop filters, these are also able to filter large quantities of water. A reverse osmosis filter uses household pressure to force water through a semi-permeable membrane. These filters reduce a large number of contaminants including pathogens, dissolved solids and volatile organic compounds. These are some of the most effective water filters on the market. However, they are significantly more expensive, and their filtration process produces large amounts of wastewater. Whole-house water filters are installed directly into your water line and provide filtered water throughout your whole house. These are beneficial for homes with very poor water quality, or very hard water that needs filtering for uses other than drinking or cooking. These reduce sediment, rust, and in some cases, chlorine. However, since they are not designed to remove many other contaminants (i.e. microbiological cysts or VOC's) they will likely need to be used in combination with other filters for clean drinking water. Fortunately, they are inexpensive and the cartridges have a long filter life. A refrigerator water filter is a space-saving filter option if you desire cold purified water and ice straight from the fridge, but don't have room inside for a pitcher. There are two types: push-in filters install directly into your refrigerator's water filter compartment; inline filters are attached to your house's water supply line on one side and to your refrigerator's water line on the other. Shower water filters attach directly to your shower head. These reduce chlorine and may aid in preventing dry skin and respiratory problems caused by prolonged chlorine exposure and inhalation. Some shower filters come with their own adjustable shower heads, giving you several different options for water flow and pressure.